IP network security cameras are an ever expanding market that allows you to monitor your home or business from anywhere you have internet access. An IP Camera is a stand-alone device that allows you to view live, full motion video over the internet. When a network IP camera captures an image, it sends live video directly over an IP network such as a LAN, intranet or the internet. The user can then control and access the camera by using a standard Web browser or video management software on any local or remote computer on a network. Authorized viewers from different locations can simultaneously access the cameras. 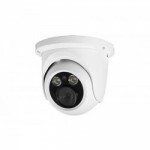 Check out the wide variety of IP cameras we offer. We have every thing from infrared vandal proof IP cameras to the latest mega pixel cameras. You may also want to try out our many pan tilt and zoom IP cameras and wireless cameras.